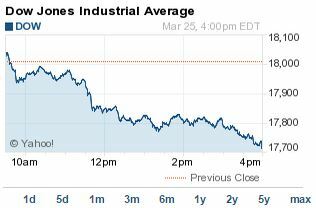 The DJIA today plunged 292 points. The Nasdaq suffered its steepest one-day decline in almost a year. What happened? A wide sell-off in the biotech and technology sectors outpaced gains fueled by news of a merger between Kraft Foods Group Inc. (Nasdaq: KRFT) and H.J. Heinz Co. The iShares Nasdaq Biotechnology ETF (Nasdaq: IBB) slumped more than 4%. Continued weakness in Europe also remains a central concern to investors. The S&P 500 Volatility Index (VIX), the market's fear gauge, surged 13.88% on the day. What Moved the DJIA Today: The markets are still jittery about pending monetary policy from the Federal Reserve at a time that concerns are emerging over second-quarter earnings season thanks to a stronger dollar and weakening economic data. Stocks with high earnings multiples like biotech and semiconductor stocks took a hit this afternoon. This morning, the February durable goods orders report registered much lower than expected, signaling that American businesses are not investing as much as needed to grow the economy. Weakness in the U.S. dollar, geopolitical tensions in Yemen, and news of speculative buying outweighed oversupply concerns in the oil markets. This morning, the Energy Information Administration (EIA) announced that U.S. crude inventories increased by another 8.2 million barrels in the week to Friday, the highest level in 80 years. Merger Mania: Before the bell today, a mega-deal hit the North American food and beverage industry. Shares of Kraft Foods Group jumped roughly 35% to hit an all-time high on news that the company will merge with H.J. Heinz Co. The merger will create a new publicly traded company called The Kraft Heinz Group. The deal is financed with a $10 billion investment by Brazilian private equity giant 3G Capital Partners LP and Warren Buffett's Berkshire Hathaway Inc.(NYSE: A). Snacks giant Mondelez International Inc. (Nasdaq: MDLZ), a company that split from Kraft in 2012, gained 2.3% on news of the deal. Getting Social: Shares of social media giant Facebook Inc. (Nasdaq: FB) slipped 2.8% as the company kicked off a two-day event for developers. The company unveiled a slew of new features today and will allow developers to create apps that function inside Facebook Messenger. In the next few days, the company will allow at least 40 new applications within the Messaging service, some of which will allow users to send animations, videos, and new content. For a breakdown of three game-changing events we expect to happen during the conference, get our full coverage of Facebook's development conference. Semiconductor Slump: Shares of the iShares PHLX Semiconductor ETF (Nasdaq: SOXX) slipped 4.65% and is now trading below its 50-day moving average. Notable sector leaders were also down sharply. NXP Semiconductors NV (Nasdaq: NXPI) fell 3.7%. Texas Instruments Inc. (Nasdaq: TXN) and Analog Devices Inc. (Nasdaq: ADI) both shed 4.64%. Tech Weakness: Shares of International Business Machines Corp. (NYSE: IBM) fell another 2.3% as the tech giant continues to experience increasing weakness in its stock price. Today's decline was fueled by a reaffirmation of a "Sell" rating by a notable analyst at Credit Suisse (NYSE ADR: CS). In a research note, the analyst projected the company is facing "a painful multiyear transition." The rating was noted in the firm's report "32 Contrarian Stock Ideas." Apple a Day:Apple stock fell 2.6% this afternoon. Shares of Apple Inc. (Nasdaq: AAPL) were likely reacting to the broader sell-off in the tech markets, although some analysts have suggested that rival Facebook's plans to turn its Messaging service into a platform could be rattling investors. Apple continues to see a surge in new competition. This is the latest attack on its products and services. Just last week, Google Inc. (Nasdaq: GOOG, GOOGL) and Intel Corp. (Nasdaq: INTC) announced plans to team up with Tag Heuer to create their own smartwatch to compete against the new Apple Watch. The Dow Jones fell nearly 300 points today, and the Nasdaq shed 118 points – its biggest decline since April 2014.